First of all, let’s think about the three waves of technical hobbies over the past century. In a technical hobby, individuals and groups tinker, learn and make. First of all, they are attracted by personal interest in a new, emerging technology. In addition, technical hobbies provide a gateway to science, technology and engineering careers . Occasionally, hobbies lead to businesses, even industries. Here’s what I mean. For sixty years, amateur radio was the leading technical hobby around the world. While separated from commercial radio, hams made many contributions to radio science and technology development. A benchmark for technical hobby culture resulted. By the late 1970’s, hobby computing took over. As with radio, personal computing quickly became a new industry. Hobby computing grew quickly, peaked within a decade, and then diffused into a variety of interests including gaming, hacking and Internet. Since 2005, the third wave of leading technical hobby is maker culture. Makers apply electronics, software, wireless and digital fabrication to make things of all sorts. Making attracts young and old in most countries. With each wave, participation grew by a factor of 5. Today, the number of kids and adults involved in making surpasses the ranks of radio hams by 25 times or more. Steve Wozniak participated in all three waves. He got his ham license in grade six, started Apple Computer, and recently commented on maker culture. Maybe we hams can learn from this progression. Attracting a few “makers” would stimulate our hobby. 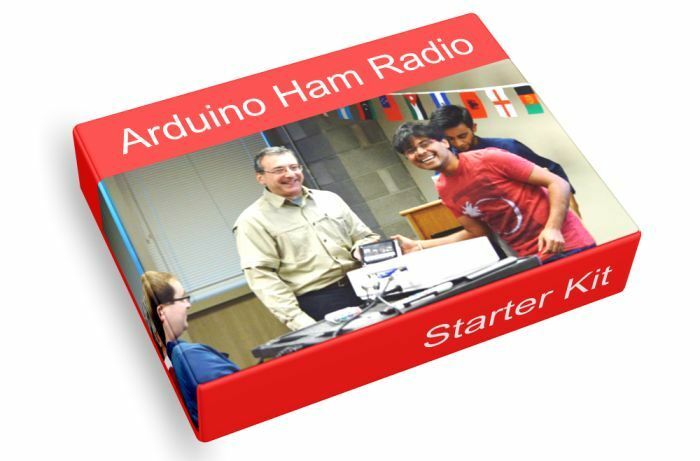 Why an Arduino Ham Radio Starter Kit? Central to the emergence and popularity of making is the Arduino microcontroller. It’s the engine under the hood for most projects, including 3D printers and DIY CNC machines. Most of all, it’s a gateway into the community. For hams, it seems like a good place to start. Traditional pathways into ham radio included fascination with radio, citizens band, shortwave listening. Not so relevant any more. Encouragement by friends and family is the remaining gateway. In order for us, as hams, to attract friends and family into the hobby, we must offer them something of interest. Most of all, we should reach them where they are already engaged – the maker community. I believe hams and makers have many common interests and synergies. Also, the great obstacle of Morse Code is no more. Finally, watch this video about the Not Your Grandpa's Ham Radio booth at a recent Maker Fair in California. Maybe your club can do similar things to engage the maker community. New pathways to ham radio are wide open. Take them. In our next article, we’ll talk about the synergy between ham radio and making.